I sense a nautical theme developing here. Still soaked from working on the Creature from the Black Lagoon, I figured I'd take a swim around the ocean this time and see what I could see. 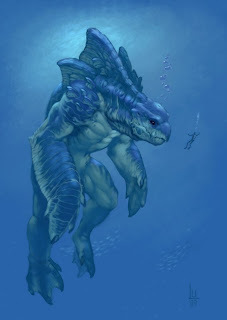 Lo, and behold...Gelugos, the Sea Titan. Very gentle, and seemingly more curious than carnivorous...I just had to capture his image. The colors borrow heavily from Todd Harris' 'Meg' image, though the concept was conceived long before I ever heard of him. Actually, I already have a blog with another company, but I figured I'd give these guys a shot and see how I like it here. Basically, a journal of my progress as an artist and illustrator, and whatever else comes up. 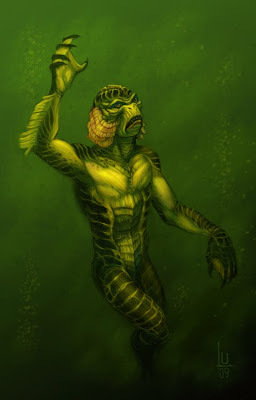 First up, The Creature from The Black Lagoon. An all time favorite of mine, and not so much a re-imagining as an update, which is hard because the original design was just so advanced for it's time. It still good creature design even by today's standards. I may go back and fiddle with it though...maybe more fins, spines...etc.